I am developing a tracking system that contains OMEGA2+, quectel MC60 GSM / GNSS chip. I shared codes on my device. I hope it is useful for someone. I wrote something on my blog about using serial port on OMEGA2+. I lived difficulties about writing python codes on OMEGA2+. I got succeed. 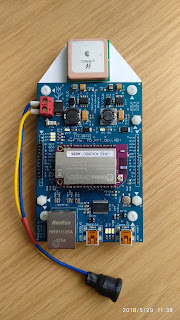 Now i have a python-OMEGA2+ board that I designed. I wrote something on my blog. People who have difficulties about communicating with OMEGA2+, can read my article. It is written Turkish Language. Hi. I searched about Omega2+ pcb drawing, I found Altium, dxf files but I couldn't open the file. Is there any dimensions drawing, pad placing about OMEGA2S+.